This Mac DVD to PSP Converter is just designed for Mac users to convert DVD to PSP MP4 video format, as well as to convert DVD to PS3 MP4 format. Such as the PSP/PS3,the MP4 format, extract DVD audio to MP3 audio format. 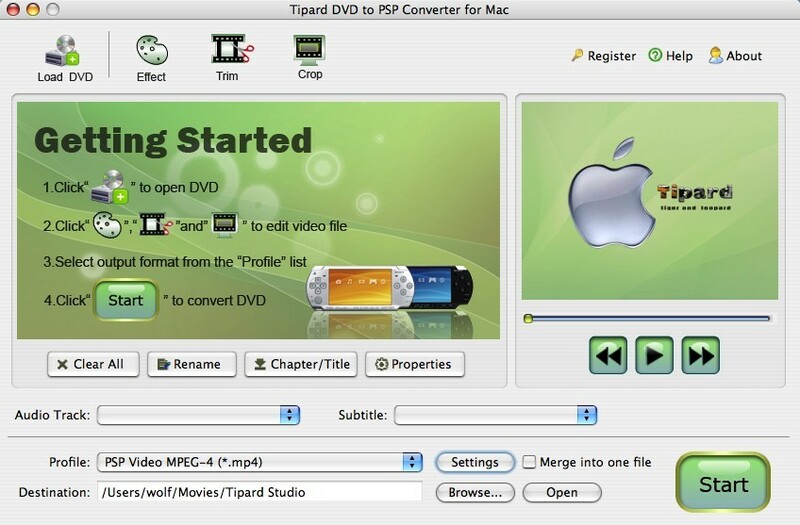 Tipard DVD to PSP Converter for Mac is poised to convert DVD to PSP on Mac. This Mac DVD to PSP Converter is just designed for Mac users to convert DVD to PSP MP4 video format, as well as to convert DVD to PS3 MP4 format. Not only for the PSP/PS3, but also is used to operate upon other devices which compatible with the MP4 format, extract DVD audio to MP3 audio format. On top of its conversion function, Tipard DVD to PSP Converter for Mac also gives you the possibilities to customize your video effect according to your preferences. Such as set adjust Brightness, Contrast, Saturation video, Hue, Volume effect, convert a part of the DVD instead of the whole, choose the target subtitle and audio track, merge several titles/chapters into one to match your PSP player and your favor. 1. Designed specialized for Mac OS X. A professional Mac DVD to PSP Converter fully compatible with Mac OS X, support Leopard and Tiger, which manage on computers with either Power PC or Intel processors. 2. Convert DVD to PSP, PS3 MP4 on Mac. Extract DVD audio to MP3 audio format. Tipard DVD to PSP Converter for Mac provides the video effect parameters, video Brightness, Contrast, Saturation, Hue and audio volume. With several files merged into one file for output, you'll enjoy a single long movie with a single click.